We’re still more than a week away from knowing what it’s like to have a giant iPod touch in our hands, but developers have been anything but idle. With Apple’s March 27 deadline for iPad apps looming, many of them have been hard at work prepping what may be the first third-party apps for the new device. Among them, Marco Arment, creator of Instapaper, who posted a sneak peek of what the forthcoming supersized version of his app will look like. Instapaper is an extremely popular iPhone app and service that let you earmark Web content to read later. It’s especially handy on the iPhone and iPod touch for when you want to read something and you’re not online: Instapaper lets you download the page to your local device for plane or subway trips. Like pretty much all the other independent developers, Arment has had no chance to actually handle an iPad, relying instead on a cardboard mockup. But if Steve Jobs’s debut of the iPad was any indication, reading is a major thrust of the device, so it’s little surprise that Arment is working hard on a version of his app, despite his reservations. The iPad version of Instapaper looks, unsurprisingly, a lot like the iPhone version, albeit with a few concessions to some of the iPad’s new abilities, like popover windows and a split view in landscape orientation. Arment also confirmed that Instapaper Pro will be a universal app for iPhone and iPad, meaning that if you buy it once, you can install it on both devices. And current Instapaper Pro owners will get the iPad version gratis. Whether or not Instapaper will surface at the iPad launch is still ultimately up to Apple, but even if it doesn’t make the initial batch, it will probably appear sooner rather than later. Plus, any delay just means that Arment gets a chance to refine it after actually getting to use an iPad. 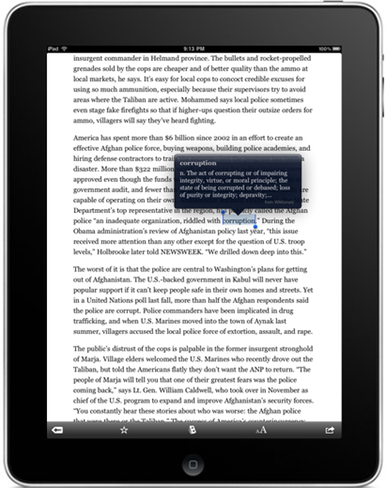 So, for those of us eager to use Instapaper on our iPads it’s a win-win situation.